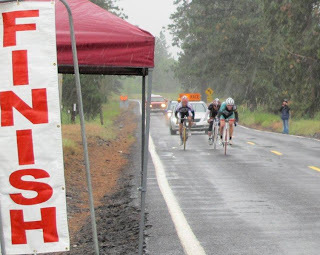 Well, the season has nicely wrapped up and while some of us are busy with cyclocross racing and training and others of us are busy with dusting off our rain bikes, there is lots of glory in the middle and the end of the 2010 road race season that has gone unreported here. So here we go! Cheney was the site of the State Championships Crit and RR this year. Several Garage racers donned their dry-weather gear and headed east. The crit was Saturday, on a hard but nicely technical *9* corner course in downtown Cheney. We only had two Cat 3s in the field, but the technical finish served us well. Alex Rosenast placed 2nd, and Tom Wick placed 3rd in the mad dash to the (state-championship) line. 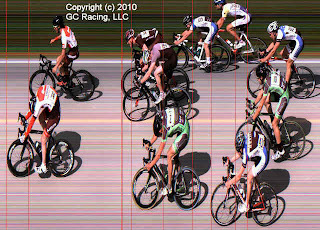 The Cat 2 race was next, and after a (typical) flurry of attacks throughout the race, Kyle Farrell got away with three laps to go, which suddenly became two laps to go after a mix-up with the lap cards. Todd Herriott came up and joined him, but the two stayed away for Kyle getting 2nd place in the race. Congratulations! The next morning was the road race, on a fantastic point-to-point 76-mile course. The Cat 2 race was first, and a strong breakaway of six went up the road with no Garage representation. They stayed away, but Hitch placed first in the pack sprint for 7th place, and Kyle Farrell was close behind in 10th for the day. The Cat 3 race was interesting. After promising teammates that he wasn't going to do anything stupid like attack early in the race, Tom attacked within the first two miles of the race and ended up riding solo off the front for about 45 miles. Three people ended up bridging to him, and then one of those flatted. Alex spent a good amount of time off the front of the pack trying to bridge up to the leaders, but he wasn't able to get up there. The break stayed away, and Tom got 2nd in the race. Alex Rosenast and David Hills got 8th and 9th on the day, with 5th and 6th in the pack sprint. A great day! Nikos Mills got 7th in the Masters A State Championships crit in Olympia on June 26. As usual, Garage posted some great results here. In the Cat 2 race, our team of Brian Hitchcock, Kyle Farrell, John Sindell, and Jason Bethel placed 2nd overall, just SIX seconds behind first place. The Garage Cat 3 team of Aaron Berntson, Aaron Lavin, Alex Rosenast, and Tom Wick won their event, for the third year in a row! Master B: Aaron Berntson 1st, with a time that would've won the Master A event, would've won the Cat 3 event, and would've been top ten of the Cat 1-2! The Masters B-C category was owned by Garage racers. Alex Rosenast repeated his last year's win at the first race at Skagit Flats. For the second race in Gig Harbor, without Alex, Aaron Lavin stepped up and took the win. 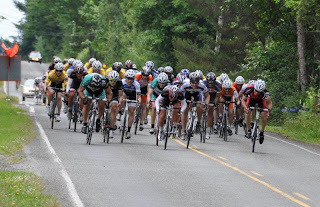 The final race in Carnation was a very close sprint, and Alex Rosenast took 2nd place and the Masters series title. Master B: Morgan Coleman 1st, nearly two minutes ahead of 2nd place! 6pm race (Cat 3-4): Alex Rosenast won the series easily, with results across the entire summer. Aaron Lavin was 3rd place, and Michael Wasserman was 6th. 7pm race (Cat 1-2-3): Kyle Farrell placed 3rd. All in all, we had a fantastic season. And we'll be back strong next year!